Best laptop in this price range!! Able to play most of the games. Screen is full hd (1920x1080) with antiglare. System is having Intel 2GB integrated graphics as well as dedicated AMD Radeon R5 M430 2 GB graphics, which switches between them. Played Rainbow six and it ran smoothly with medium settings and 1366x768(HD), lagged a little when played in full hd (19201080). Overall volume was low but was giving a clear and virtual surround output. Was giving around 3-4 hrs backup with normal use and upto 2 hrs with heavy use (gaming, playing videos, internet etc). Good specs at this price range. Comparatively compact to other bulky laptops. Smooth operation and no lags. Sound quality is good but not high enough. good product . 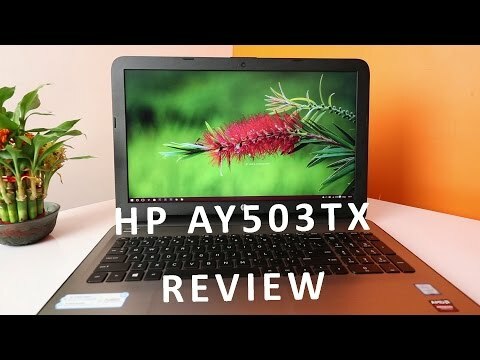 I got this laptop at AROUND rs.41,000 I found only only one problem is that its has no nvidia graphics with this range of hp notebooks and only 3hr backup when we use continuously. The price of the laptop is quite affordable & economical as whatever feature are there in the laptop. But was giving around 3-4 hrs backup with normal use and upto 2 hrs with heavy use only. No light for power button, so little . Best laptop. Comes good to expectations. Screen is big with high definition antiglare. Sound system works well. Love it&apos;s battery backup. Compact size makes it the first choice of every customer. Easy usage. High quality results. Power button gets lost Coz of absence of light in it. Ay503tx is one of few good laptops available with both Full HD screen and dedicated graphics card for 42k+ rupees. You get almost everything that a mid-range laptop buyer would expect to have on this laptop. 29 Pricebaba users have written their experience with HP 15-ay503tx (Z1D92PA)(i5 6th Gen/8GB/1TB/DOS/2GB GFX). If you own HP 15-ay503tx (Z1D92PA)(i5 6th Gen/8GB/1TB/DOS/2GB GFX), please do leave your feedback too. HP 15-ay503tx is a 15.6-inch laptop by popular manufacturer HP. According to the specifications, the laptop is decently priced. Let’s take a look at all the aspects of this laptop. The HP 15-ay503tx is powered by an Intel core i5 6th gen processor which is coupled with a massive 8GB of RAM. Given the specifications, performance in the laptop shall be very smooth. It is well equipped for multi-tasking and heavy applications will run seamlessly. Graphic performance can be expected to run smooth as well because the laptop packs a 2GB AMD Radeon R5M430 card. It comes with DOS and needs separate OS installation. The laptop comes with a 15.6-inch display which has a Full HD resolution of 1920x1080 pixels. The screen is SVA Anti-Glare WLED-Backlit which will be decent for viewing multi-media content. For listening audio, a headphone + microphone combo jack is provided. There are dual speakers provided in the laptop for those who don’t wish to hear audio through microphones. This laptop can be used for charging your battery-powered USB peripherals with its USB 2.0 port. HP has been generous to include USB 3.0 connectivity as well. While using CDs and DVDs may not be the most common practice today, this one is versatile enough to allow the same using its optical drive bay. To connect to the intranet in an office environment, there's a Ethernet port available. The following media card formats are supported by this machine: SD, SDHC, SDXC. The battery capacity of the device is 41 Whr. This HP manufactured laptop is 2.19 kg in weight. As for dimensions, the laptop measures 15.13 x 10.03 x 0.96.